The Ancient Egyptians revered it and called it “Ta netjer“, the “Land of the God” for good reasons. Discovering the true history of Punt (the Horn of Africa) and camel domestication would certainly change human history and religions totally. Taking deep look into the Old Testament from totally new perspective might change our understanding fundamentally. Answering a very basic question that had been ignored for millennia: Could Abraham, the Israelites, and all locations in the OT be from Punt Land? The repeated mention of camels in the OT was not a mistake. It implies that the whole stories and all characters and places were never in Arabia, Assyria, Aram and Kemet. If this new assumption is true then King Solomon and the Temple and Jerusalem were somewhere in Punt Land and nothing was outside Africa, except the forgeries of Turkic Mongolian Persians and their inventions. This would be a total paradigm shift confining the Israelites and the Law of Moses to Africa; and the Jews and their Talmud to western Asia. Facts about the presence and domestication of single-humped Camel (dromedary) would change human history and religions totally. Sure Yeshua was real, but he could be unrelated to the Israelites who were using camels since Abraham. This makes the Israelites completely Africans from Punt Land (the Horn of Africa). 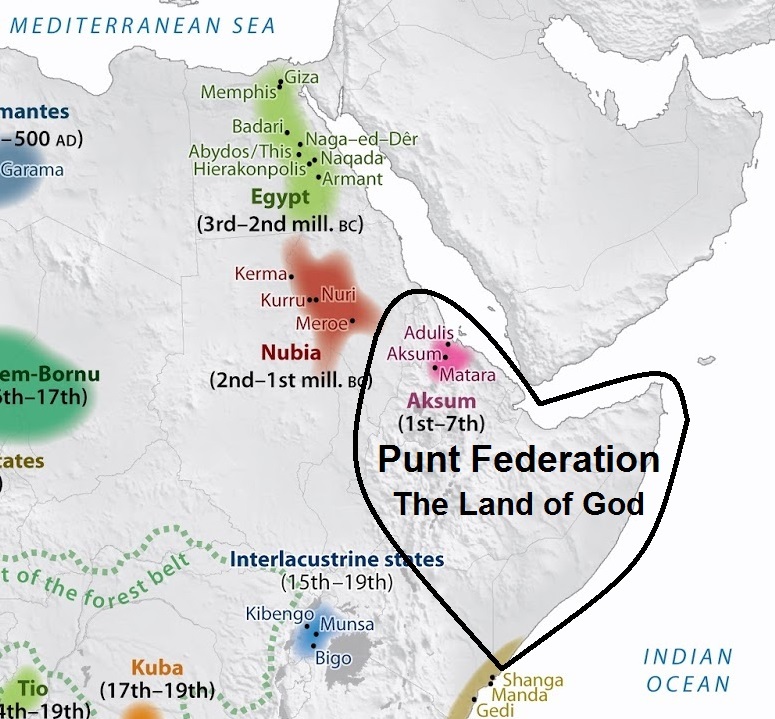 Punt Land includes: Ethiopia; Somalia; Djibouti; Eritrea; and Beja land. By its Science division the New York Times posted an article by John Noble Wilford, on Feb. 10, 2014 titled: “Camels Had No Business in Genesis” stating that “There are too many camels in the Bible, out of time and out of place”. This research do not understand or believe that the Patriarchs actually lived in Punt not in Arabia, Aram, Assyria, or Kemt! Camels are literally destroying their perceptions and tales. Hud was a prophet of ancient Arabia mentioned in the Qur’an. The eleventh chapter of the Quran, Hud, is named after him, though the narrative of Hud comprises only a small portion of the chapter. Hud has sometimes been identified with Eber, an ancestor of the Israelites who is mentioned in the Old Testament. There is a region called Haud located about 350 kilometers east of the historic town of Harar. The city of Harar has two prominent features, which are: 1. it is an old walled city and has five gates; and 2. it is called “the City of Saints”; and even considered as a holy city by some. Located 52 kilometers to the north-west, to Harar there is the historic town of Dire Dawa, close to it the Harlaa site where archaeologists have uncovered an ancient, forgotten city in Ethiopia once thought to be the home of giants. This is the first evidence which proves Eastern Ethiopia was well connected with the Gulf, Egypt and India hundreds of years ago and highlights how skilled craftsmen traded with communities around the world and lived alongside people from different areas around the Indian Ocean and Red Sea. 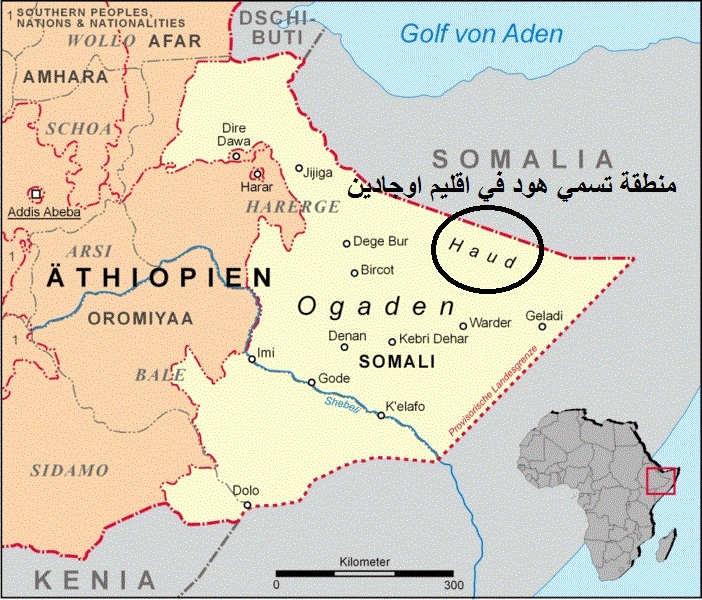 Haud Region (or Hawd; Amharic: ሓውድ) is a region of thorn-bush and grasslands in the Horn of Africa. It includes the eastern side Somali region of Ethiopia or it means south Somaliland. It is of indeterminate extent; some authorities consider it denotes the part of Ethiopia east of the city of Harar. For decades following the Italian invasion of Ethiopia in 1941 it (as well as the entire Ogaden) has been an area of conflict and controversy. (Note: the page about Haud Region on Wikipedia is translated only to Català; Deutsch; Italiano; and Hebrew only. A Somali translation is less than one line. There is no Amharic or any Ethiopian or Arabic translations). The old continuous interests of Italy, Israel, and Turkey in this impoverished region raise many questions about their historic motives. The three states originated from Turkic Mongolian groups kin to the Persians. These Turkic Mongolians invented Jewishness and emulated the Israelite and the Law of Moses in 530 BC. The First Italo-Ethiopian Invasion was fought between Italy and Ethiopia from 1895 to 1896. It ended with Ethiopian victory. The Second Italo-Ethiopian War from 3 October 1935 until 1939. Ethiopia was defeated, annexed and subjected to military occupation. Italian East Africa (Italian: Africa Orientale Italiana) was an Italian colony in the Horn of Africa. It was formed in 1936 through the merger of Italian Somaliland, Italian Eritrea, and the newly conquered Ethiopian Empire which became Italian Ethiopia. Discovering the true history of Punt (the Horn of Africa) and camel domestication would certainly change human history and religions totally. Tariq, i have been viewing your literature for sometime and i am fascinated that i share almost the same opinion as you. I have been saying this for years that Although the stories of the prophets are true.. that it may have taken place in west arabia and the horn of africa. To help you back up your research. As well as geographical features like camels and the incense. Tribal names are very important to look at. Lets take a look at ‘northern somalia’ where the land of pubt is most likely situated. The largest tribe that live there are called isaaq/ ishaaq/ ISAAC. They are sunni muslims and have some sort of relations with the bani hashim. But as you know as a sudani tariq, many tribes though are sudanese claim that they are related to the prophet muhammed pbuh. But it may not be the case rather just to add a bit of ‘prestige’. It may be the case of the isaaq. They may be the actual surviving hebrews. Ironically are muslims. Thank you very much for your opinion and observations. Also, the common popular names in the whole of the Horn of Africa indicate old strong influences and presence since Abraham which are not present elsewhere. Abraham, Issac, Jacob, Ismael, Joseph, Zephora, Shua’eb, Mussa, and more are more frequent in Punt. In fact, used to follow a wrong assumption that Abraham and his descendants were Yemeni Arabs but took refuge only in Punt since 1876 BC. Then I have just revised my hypothesis after I discovered that camels were not in Yemen. Certainly, Abraham people were nomads who lived within Punt, and Punt was more than just Somalia.